As you already know one of the greatest challenges we face is our Christian walk. Every day there are a multitude of difficulties testing us. There are storms trying to wreck havoc on our lives. There are temptations trying to detour us from our Christian path. The bible tells us that Jesus is our greatest source of encouragement, “Jesus understands every weakness of ours, because he was tempted in every way that we are. But he did not sin! So whenever we are in need, we should come bravely before the throne of our merciful God. There we will be treated with undeserved kindness, and we will find help.” (Hebrews 4:15–16, CEV) And because Jesus lives in our hearts through to the Holy Spirit we too are sources of encouragement to others. 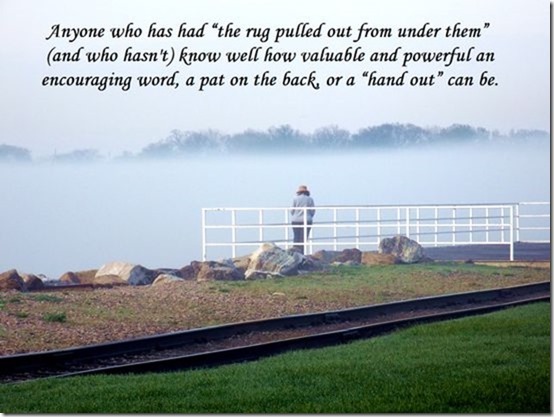 Anyone who has had “the rug pulled out from under them” (and who hasn’t) know well how valuable and powerful an encouraging word, a pat on the back, or a “hand out” can be. Encouragement given to someone is like a ray of sunshine on a dark stormy night. Like all gifts the gift of encouragement needs to be received and sometimes that in itself is a great challenge. Scriptures marked AMP have been taken from The Amplified Bible. Copyright 1954, 1958, 1962, 1964, 1965, 1987 by: The Lockman Foundation, La Habra, CA. All rights reserved.